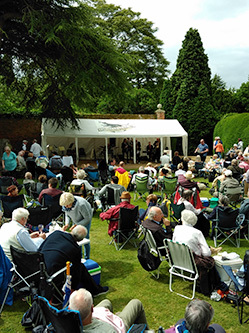 Despite the overcast and slightly cool weather, nearly 400 people gathered in Elgood’s Brewery Gardens to enjoy an afternoon of jazz organised by Dave & Sheila Dyer. Music was provided by the Peter Rudeforth Jazz Band who played a wonderful selection of classic numbers with some stunning solos from the band members. In between sets from the Jazz Band, the audience was treated to music from a Ukulele Band whose line-up included our very own Dave Dyer. A fantastic range of prizes had been donated for a raffle in support of Norfolk Hospice Tapping House, which raised £500 in total for this worthy cause. Dave Sheila were delighted with the turn out and they expressed their thanks to everyone at Elgood’s who helped with the organisation and to Nigel & Anne Elgood for hosting the event.